This leaves me in something of a quandary, because it’s really quite hard to say all that much constructive about a book that’s just so brilliant as this. I suppose I could begin by giving a quick blurb on what it’s about. 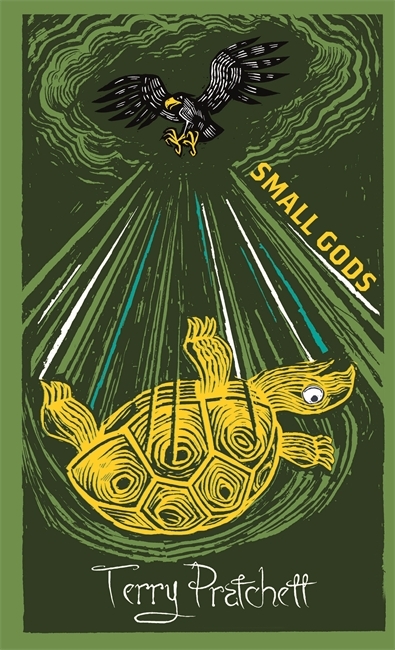 Small Gods is a standalone novel, set on the Discworld but with very, very minimal overt connections to preceding books (and almost as few to later books). It’s set principally in the tyrannical theocracy of Omnia, and principally follows a young novice named Brutha, who is big, slow-thinking, but with a flawless photographic memory. It is a satire of organised religion, and to a lesser extent of politics and of all coercive institutions. I could also I guess give a little bit of context: this is the thirteenth Discworld novel (though it was considered the twelfth at the time), and it follows and largely caps a run of novels with quite a distinct thematic focus. Moving Pictures, Reaper Man and Witches Abroad were all about the power of stories, about images and reflections, and about dehumanisation, all set in a world where belief shapes reality. Small Gods feels like the natural endpoint of those ruminations (not that these themes ever entirely go away in Pratchett), turning the lens on the biggest stories of all. [In a subtle nod to the reflection obsession of Witches Abroad and its mirror-magic, Omnia has ruled all mirrors to be unholy and forbidden them on pain of horrible torture]. In terms of writing style, Small Gods continues very much in the vein of the fantastic concluding portion of Witches Abroad – only here that brilliance extends throughout the entire book, with no portions of filler at all. [Pratchett has finally mastered the technique, which he introduced in a big way in Sourcery, of including narratively tangential passages in a way that makes them appear thematically integral to the novel, even if on a surface level they appear to be throwaway jokes that have mysteriously been shoved into the middle of an important section describing events a long way away that they don’t overtly relate to in any way; it’s a wonderfully impressionistic effect, and would probably be lauded in postmodern literary circles, if it weren’t taking place in a comedic fantasy novel]. But at the same time, Small Gods is not only narratively but, as it were, texturally different from the books that came before – there are, for instance, relatively few in-jokes and running gags from previous novels. I suspect Pratchett may have been intentionally trying to make this book accessible to new readers [it’s not important, but it’s also interesting to note that Small Gods fits in poorly with the timeline, and may be set either contemporaneously with other Discworld novels or else hundreds of years earlier]. I guess I should discuss the flaws in the book. The treatment of organised religion is… unsympathetic. As a not-so-veiled parody of Catholicism (with a slight hint of Islam), it would have Richard Dawkins protesting that the treatment was one-sided and uncharitable. Indeed, one wonders how much Dawkins must hate this book, as it renders him rather irrelevent – I should imagine Small Gods is more effective at converting the (in)fidel than Dawkins’ entire career (plus there are a couple of digs at him along the way). As the novel progresses, the plot provides a distraction, there’s more time spent away from the church hierarchy, and the novel attempts to develop a distinction, it seems, between organised religion and personal faith, all of which attenuates somewhat the sheer vitriolic simplicity of the attack, but in the early going it’s more than a little off-putting for anyone who isn’t a signed-up card-carrying enemy of the church. Even in the later going, Pratchett’s treatment of religion feels both more dogmatic (though he does spare a little criticism for atheists too) and more simplistic than in the similar but more nuanced earlier novel, Pyramids. More generally, the one-sidedness of this treatment explains, or perhaps is explained by, what I felt to be a disappointing lack of ambition in the novel. By making the Church and its Inquisitors (and Exquisitors) so unredeemably evil, he provides a get-out-of-jail-free card so generous that it’s a little hard to see who is really going to be challenged by this book. Yes, the simplicity may be grating for many, but there’s such a large ‘I’m not talking about religion per se just about organised religion and only really fossilised and horribly sadistic organised religions actually’ loophole that anyone to the left of Torquemada can nod along and say “oh, he’s not talking about me, I’m a moderate!”. Where Pyramids felt like a man exploring an issue, Small Gods feels like a man who has ‘solved’ an issue for himself and is determined to tell everyone about it… in which case he should at least have the decency to say something controversial! There’s nothing worse than a man dogmatically insisting upon things that everyone already agrees with. It may feel a little Monty Python at times, but this isn’t even at the controversy-level of Life of Brian. Remarkably, the book this really reminded me of was A Canticle for Leibowitz – strange to say, but the SF about Catholic monks discussing moral issues and the fantasy about the evils of organised religion actually say a lot of quite similar things. The difference is, Leibowitz has God to fill the gap – the believer can rely on faith in the mercy and justice of God, can rely on a supernaturally indomitable hope against hope, to reassure him a) that what he thinks is right is right, and b) that if he just does what is right, everything will work out for the best, even if it doesn’t seem that way right now. Pratchett doesn’t have that, so he bridges the gap simply by appealing to himself as the author (while not noticing that bridging that gap, whether through faith or through narcissism or whatever, is exactly what leads people like Vorbis to be able to act how they do). (The other difference is that Leibowitz, though it overtly lectures in a way that Small Gods does not, is actually the more doubt-filled and ambiguous of the two). Moving away from the themes, I think it’s also fair to say that, as is often the case, the ending is a little bit too complicated and drawn-out, with too many different climaxes. On the other hand, this does feel much more justified than in, say, Witches Abroad, where the end was an unravelling of complications that had only that minute been put in place – in Small Gods, by contrast, each part does feel justified in light of what came before. But it is still a little anticlimactic (the bit that people remember as the end of the novel has a good thirty or forty pages after it). Well, I think that’s all I can think of. What this novel does have going for it is, basically, everything good that Pratchett can do. Silky, stylish prose? Oh, check, definitely, some great descriptive passages. Humour? Sure. This probably isn’t one of his absolute, laugh-out-loud funniest books, but it’s consistently amusing. As usual, the humour combines a sardonic wit and sense of irony with a dash of the absurd, a sprinkling of unexpected cultural references, and the odd groan-inducing pun (sometimes obvious, sometimes deviously hidden). Deep, meaningful themes? Check. As I’ve suggest above, I felt that Pratchett fails to show his working adequately in places and is preaching to the choir in many more, but nonetheless, these are important questions he’s considering – particularly if, as I think is fair, you look beyond the immediate religious context of the book and treat it more as a consideration on systems of authority, hierarchy and intellectual control. It should also be said that the frustrating inadequacy of the intellectual side of the book is only brought to the front by Pratchett’s willingness to engage on these issues in a way that is unexpected for ‘this sort of’ book. Clever and effective plotting? Sure! I’m only 90% sold on the ending, but otherwise this is one of the tautest and most professional novels Pratchett has written. Though there are many superficial little diversions and flourishes, fundamentally there’s no flab here, with everything working together like so many cogs. Badass awesomeness? Ooooh yeah. At his best, Pratchett can write scenes that appeal on a really instinctual, primal level. He reached that point at the end of Witches Abroad, but here it feels like the whole second half of the book is a long series of fully-earned ‘crowning moments of awesome’. [Sorry to get all tropery on you there, but… that really is what they are]. A key part of this I think is metaphor. Pratchett can always carve a fascinating metaphor, but here they’re not just imaginative, they’re powerful, and they’re not just powerful, they’re cohesive, and they mount up in a way that gives the book a frankly Biblical grandeur in places. This reminds me of (conincidentally, given the titles) The God of Small Things, where I think I said in my review that Roy uses metaphor, and repeating patterns of metaphor, in such a way as to in effect construct her own language, her own shorthand for the reader. Pratchett doesn’t do it to quite the same extent, but the continuation and repetition of certain metaphors and images – of the desert and the sea, of rocks and sand, of eagles and tortoises, goats and sheep and so on – acts as this deep and powerful ostinato beneath the events of the plot, giving an intestinal resonance to their notes. Appeal to all the family? Indeed. For young kids, there’s plenty of wacky moments and silly lines. For older kids, there’s a real feeling of significance to the book, a feeling that this is a book that people should shape their lives by – and maybe it’s a bit too simplistic for the most sophisticated readers, but this could and I’m sure does work fantastically for younger readers: Pratchett is a writer who can do that tricky thing of feeling like a father and a friend at the same time, giving you a line on important life truths without feeling too much like he’s lecturing you. For adults, there are the hidden layers of meaning. And for everyone there’s a really good exciting story being told. Oh, and in Brutha Pratchett not only has a great character but a really great (a little less great on too close an inspection when you can see the seams but still great) character progression – something that normally isn’t one of Pratchett’s strong point. And aside from Brutha, and of course Vorbis (who, yes, is cool, but let’s face it he’s just the nightmare lovechild of Dios and Vetinari), there’s the incredible creation of Didactylos (clever name there, btw), who feels like an icon for philosophy fans, and has the wit and wisdom to live up to the billing. So what you get with this book, in the end, is… an astonishingly good book. Yes, one gets the feeling that maybe Pratchett was just a touch too careful in making sure he could land this one, maybe he could have pushed it a little more in places. But at the same time: wow. I mean honestly. If anyone ever doubts that either fantasy or comedy can be wonderfully-written and meaningful literature, this has to be near the top of the list to prove them wrong. Adrenaline: 4/5. Not exactly a thriller, per se, but there’s an effective plot with plenty of twists but that never gets confusing, and that trots along at a very decent pace throughout with a real sense of threat and uncertainty for characters I cared about. Emotion: 4/5. I didn’t actually cry, but I did well up at times, which I think is as much about the power of the writing as about the engagement with the characters, but still: I really did care about what happens, and there are so many, so many classic scenes of triumph and defeat. Thought: 4/5. Stops short of being a really sophisticated take on the topic, opting for polish rather than breadth. But it still takes on big question, and while it may not fully honour them it never feels façile or ignorant either. Plus a twisty plot and clever bits. Beauty: 5/5. Oh, Pratchett can be so beautiful at times. The imagery, the metaphors, the finely-weighted prose. He’s not the greatest living stylist, I’m sure – he’s a little too polished for that, a little too formulaic at times – but on form he can be a great one, with the imagination and insight to make up for any momentary lapses… and here he’s on form almost continuously. There are too many wonderfully quotable lines to count, ranging from the witty to the profound. Craft: 5/5. Quibbles about him not always doing what I wanted him to do aside, and giving him the benefit of the doubt on the very slight foot fault on the final landing, this is one where Pratchett Gets It Right. He’s always strong on the details, but he sometimes loses marks on the big picture, with problems in pacing or in bringing the subplots together. Not here – this is one of the few times when it feels as though he may have planned it all in advance. In fact, I’m not giving him enough credit here, because this is a book just so full of foreshadowing that it really bowls me over how clever the man is. Originality: 4/5. To be honest, 3/5 would probably be more impartial – it’s a religious satire, at least in part, and you can’t write one of those without treading some old ground. But the way Pratchett treads is – the way Pratchett doesn’t just find his own path but takes everyone else’s paths and commandeers them to a point where it seems like the whole area must just belong to him, that’s original. Nobody else could have written this. Overall: 7/7. BRILLIANT. There are no reasons not to read Small Gods, and indeed given its short length and wide availability there are really very few excuses for not reading Small Gods. There are, perhaps, two reasons not to read Small Gods before reading other Discworld books: first, that if this is the sort of thing that irritates you, Pratchett’s treatment of religion and ethics maybe doesn’t display him at his most immediately likeable (although the sheer brilliance of the novel as a whole is likely to wear down any initial reservations, I think); and, more importantly, that maybe it’s not the most fun way, to begin with the best and then work your way down – the earlier books rarely have the proficiency of this one, and the later books rarely have the originality and passion of this one. This is why I would probably recommend starting a few books back and working up to Small Gods. Having said that, if you don’t think you’re going to read Discworld, you should read Small Gods anyway. Unless you’re a teenager growing up in a conservative family, or a fanatical hardline believer on the cusp of major crisis of faith, this probably isn’t a book that’s going to change your life. But it is a book that is really, really well written, and a great deal of fun. Verbal personal agreement is comparatively simple. In discursive syntax, animate human subjects and objects trigger zero morpheme agreement affixes, except that female subjects of active dynamic verbs require the prefix ku-. This female prefix applies to kanuhà, tanù, and mahàuko, but not to kùnyi. In directive syntax, the first-person subject prefix may be wa-, wanà-, wāta-, ba-, banà-, bāta-, ka-, kanà-, kāta-, ma-, manà-, māta-, kumà-, dān-, dāntā-, īnku-, koanà-, loka-, or lokanà-. Of these, the wa- series are used for inclusive plurals, while the others may be singulars or exclusive plurals. Ba- projects a male identity (it is not used by kùnyi); ka- projects a female identity. Ma- does not project a gendered identity, is favoured by kùnyi, and is also used when there is reason to avoid sexualising a situation (for instance, a man issuing commands to a woman will often prefer the more neutral and inoffensive ma-, to avoid seeming to usurp the place of her husband; likewise, women dealing with men outside the home may insist on ma- to avoid any appearance of flirtation or weakness). Bāta- and kāta- are forms used only by aristocrats, only when talking to their inferiors, and only in commanding situations; māta- is the corresponding neutral prefix, but is much less common, with men and women almost always using gendered prefixes in these situations, and kùnyi largely avoiding the register altogether – māta- is used mostly by mixed-gender groups, or implying the possibility of such a group. It is often used by officials claiming the shadowy plurality of ‘the nation’ and its government; it is a very formal and often very pompous prefix. Dān- and dāntā- are two more prefixes associated with command and high social station, usually reserved for clan or sept matriarchs or patriarchs, and government officials, or sometimes house matriarchs/patriarchs when exercising their authority; īnku- is a specifically feminine form for use by matriarchs when commanding. Loka- is used only by foreigners and members of ethnic minorities. 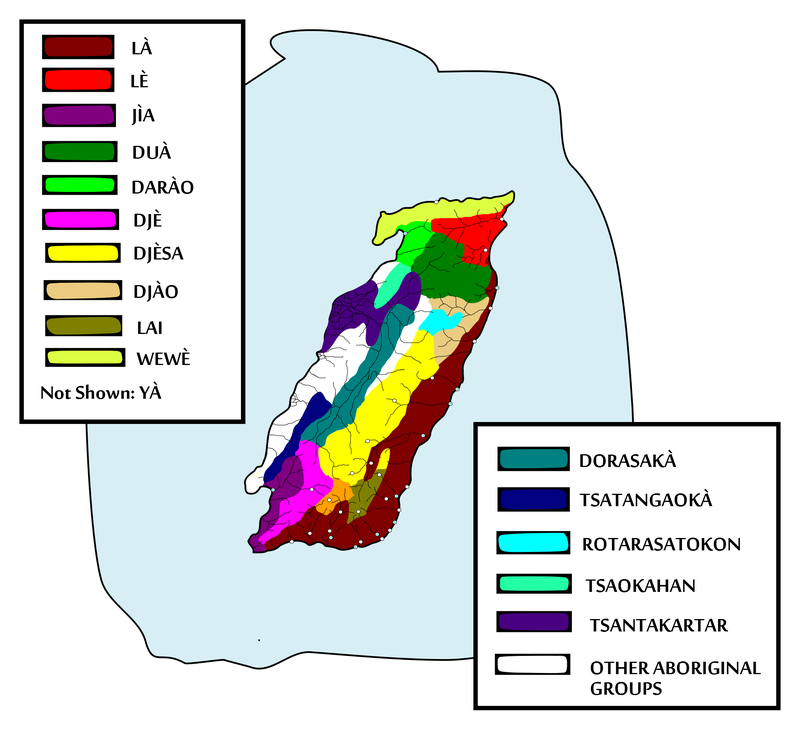 Wāta- is the inclusive counterpart to māta-/bāta-/kāta-. This leaves the diminutive forms. Banà- in theory projects the identity of a young or inferior male; in practice, however, it is only employed by women or children, usually by either kanuhà or kùnyi (never by mahàuko). It is meant to be endearing, and when used in talking to another woman it suggests that the speaker is taking a more male (i.e. executive) role without appearing an imposition or assumption. Kanà- and kumà- both project young or inferior female identities, and the differences between them are sometimes hard to pin down – in general, kanà- is the more feminine and endearing, while the emphasis of kumà- is more on being diffident; kumà- may be used by kùnyi sometimes, while kanà- almost never is, and, counterintuitively, kumà- may also sometimes by used by the hyper-masculine òro, particularly when showing affection to another òro or to a yajò. Lokanà- is a diminutive form to loka-, and is used by foreigners and members of ethnic groups when stressing their inferiority (and sometimes by Là when jocularly asserting their own ignorance or barbarism). Finally, koanà- is a humble suffix, used by members of certain unclean professions, and by anybody talking to somebody of far greater station or import, or when begging a favour. Object suffixes are much simpler: -wa is used for inclusive plurals, -ma is used otherwise, except by those of particularly high status, who use –dān. There are only three second-person prefixes: tu- for commoners, ōtu- for nobles (as with directive syntax, the status of rural freeholders is ambiguous), and angātu- is an honorific. The second-person suffixes are a little more numerous: -tu for commoners, –tutò for nobles, and -tuhònga as a petty honorific (often reflecting personal respect more than social status), plus –arahòngan as a higher honorific. Third-person ra- is used for both common men and common women, āra- and kūra- are used for noble men and women respectively, and hamāra- and ōdahamāra- are honorifics; in suffixes, -ra­ suffices for all non-honorific uses, but there are three honorifics, -āruyan, –hasharuàn, and –ōndāndratōhāshangāhāmārānu, which is only used in extreme cases. It should be noted that the use of graduating or degraduating verbs does not alter the appropriate agreement prefixes. This impossibility arises because sailors are assumed to be male, girls are female, and thus sailors cannot be kicked by girls, who are lower in the animacy hierarchy than men. The sentence is marked as questionable rather than outright false only because such a sentence would be taken as implying that the sailor was female – taken literally, this is grammatically impossible (sailors cannot be female – although women may sometimes for some reason help to sail a ship, this cannot make them sailors; contrariwise, a woman who really was a sailor clearly would not be a woman at all), but it may be a conceivable, if strange, way of insulting the sailor. (Referring to men as women and vice versa is not a typical insult among the Là, but it may be found insulting by particular men or women for personal reasons). Note that there are two kinds of prohibition here: grammatical and political. It is ungrammatical for the girl or the rat to be the subject of w-, but all three could grammatically be the subject of humùn- or mal-. It is merely a matter of politeness that girls are typically given their own verb, and that men use the verb they are entitled to. These politeness prohibitions are adjustable – it is quite common to make females the subjects of animals verbs, either affectionately or rudely, while men may be intentionally made the subject of non-male verbs to indicate that they are acting in a feminine/bestial manner. The grammatical prohibitions, however, are not so easily disobeyed. If the salungàhara is the dominant aristocratic artform in terms of vitality, the somyangahàra is the artform with perhaps the highest prestige. This is a poetic and musical art, in which poems are sung with musical accompaniment. Somyangahàra are primarily an aristocratic interest, and they are almost always performed indoors, within a baryōng. The lower classes have a passing interest in the artform, and somyangahàra are sometimes performed for a lower-class audience, though they are rarely the main attraction. Somyangahàra are performed by aristocrats for their families and friends, but also sometimes by their servants and junior relatives (usually for their superiors alone, though close family friends may also be present, particularly if the performer is unusually talented). They are not typically performed by professionals for a noble audience, although there are a small number of professionals who perform for lower-class gatherings, most as a diversion during or around a dujdahonday performance. Professionals who specialise only in somyangahàra are among the most despised members of society – in addition to the indignity of attempting to make money out of the art, it is assumed that these people are either peasants who are seeking to imitate noble ways or else aristocrats who have been ostracised and forced into poverty for some unknown crime. Some somyangahàra, particularly the most famous, may also be learnt by peasants and recited for themselves or their family or friends. Typically, a somyangahàra requires two performers, sometimes more; often, sets of somyangahàra will rotate the performance duties, so that the accompanist becomes the soloist and vice versa. The composition of somyangahàra is primarily a display of intelligence: the poem should impress the audience with the wit of the poet. The better examples seek a general and universal significance; but they are best when they avoid outright didacticism, and in particular the poet should be recognisable through their style, not through their individual attitudes or beliefs (although of course some element of this is inevitable). Poems may thus be sharp, but should not be strident. The performance of somyangahàra likewise should display the quality of the performer, not their individual natures. Performance, both vocal and instrumental, should be simple, clear, crisp, and unaffected: the performer exists to present the poem, not to call attention to themselves. Ideally, the audience should first applaud the poem, and only then recollect how well it was sung, which itself is primarily a matter of not getting in the way of the poem. As an aristocratic and amateur artform, there is a degree to which somyangahàra ‘ought’ to be primarily for the benefit of the performer, and to this end there is some theory about the possession of the performer by the poem, and hence the performer’s connection to the time and place of its composition and to the genius of the poet. However, in practice performances are primarily for the sake of the audience. Composition is somewhat more egocentric, as an expression of an inner creative urge, and indeed it is not unusual for some poets to only share their better works; again, though, nobles primarily compose somyangahàra to please their audience. The somyangahàra has several subforms, but all are characterised by their brevity. Almost all forms are structured in couplets, and poems may be as short as a single couplet or as long as sixteen couplets (poems of thirty-two, sixty-four or even one-hundred-and-twenty-eight have been composed, but are very rare, and only a handful are widely performed). The original form of the couplet was a sung call followed by an instrumental response, and this remains the dominant form; sometimes this pattern is inverted, or couplets of both types combined; double-instrumental ‘puzzle’ couplets are also found, as are, more rarely, lines that combine instrumental and vocal elements. A minority of poems are based on quatrains, which may feature one singer and two instruments (ABAC, ABCA or BACA, in decreasing order of likelihood), two singers and one instrument, two singers and two instruments, or sometimes one singer and three instruments. Forms involving two singers may in some cases feature only one singer, adopting different pitches or registers to distinguish two voices. A small number of poems are based on triplets or quintains; triplet poems are usually composed of three, and rarely nine, triplets; quintain poems are usually of one, two, three, or five quintains. Poems based on larger units than quintains do exist, but are highly unusual. Within each couplet (quatrain, triplet or quintain), each line has a fixed number of morae, although in some forms a degree of leniency may be found. The melodic contour of each line is (almost) entirely determined by the natural pitch-accent of the words, and each line has a fixed number of melodic peaks, which include not only accented syllables but also some stressed syllables and long vowels. Typically, mora and peak numbers are maintained between couplets also, although this is not always the case. Some forms insist on identical melodic contours at the beginning and/or end of lines. Many forms also insist on patterns of alliteration and assonance between lines. The distinctive feature of somyangahàra is the way in which instruments, usually aerophones, are used in place of human voices. By tying melodic line so closely to natural vocal pitch contours, the poet attempts to use the melodic contour of the instrumental line to imply a certain vocal pitch contour; combined with the context provided by the sung lines, and where applicable the rules of assonance and consonance, this should suggest to the listener one or several possible unsung, ‘hidden’ poetic lines: that is, the instrument is fancifully imagined to be singing a given poetic line, and the hearer attempts to deduce what it must be from the melody and formal constraints, even in the absence of phonemes. Of course, in some cases more than one possible line may fit the requirements, which is an ambiguity often used for humorous effect. ‘Puzzle’ couplets, or entire puzzle poems, minimise the spoken content to leave the ‘underlying’ poetry extremely difficult to deduce. In addition to the melodic use of instruments, somyangahàra are often accompanied harmonically. There are five main genres of somyangahàra: solicitation, argument, inquisition, enthusiasm, and rumination. Solicitation poems are the oldest genre, and the most popular: these feature two or more characters, in which one character makes sexual suggestions to the other. Typically, the solicitation is done by the instrumental voice, which allows the risqué content to be suggested to the audience without being spoken out loud or explicitly confirmed, for humorous effect; usually, the sung lines will begin respectably, but become increasingly risqué themselves, with even more bawdy content suggested by the instrumental replies. An inverted form gives the solicitation, usually more polite, to the sung voice, allowing the instrument to give replies that may be ambiguously interpreted as either rejections or bawdy acceptance. Argument songs were next to develop and the next most popular: here, the two (or more) voices have a disagreement on some issue – typically, a domestic decision that has to be made – and the humour comes from the increasing anger of the two parties, and imparticular by the intemperate language suggested by the instrumental lines. Inquisition poems give the sung voice a series of questions on a practical issue, with the instrumental lines suggesting evasive or ambiguous answers, to the irritation of the sung voice – often the instrumental line represents a child, or sometimes a spouse or sullen servant. Enthusiasm poems pit one character who is interested in or enthusiastic about something with a second character, played by the instrument, whose implied responses undercut the enthusiastic partner sarcastically. Finally, rumination poems ask questions or make provocative observations on some deep question of psychology, philosophy, physics or politics, and the instrumental responses give ambiguous answers – these are the only somyangahàra where humour is not expected (though some specific examples of the other genres may subvert the expectation of humour). Generally, the content of the somyangahàra is personal – sometimes genuinely personal to the poet, and otherwise an imitation of personal content, rooted in domestic concerns (although some poets have used this foundation as a basis for political or satirical commentary). A minority of works derive their content from the Immortal Classics, but even there the evidence is on personal experience, not on the broader plots – worthy of note, however, is the technique whereby the taboo on representation of real individuals can be circumvented by representing their dialogue instrumentally. Musically, there are two dimensions: the instrumental lines and the accompaniment. Instrumental lines are generally played on aerophones, which imitate the human voice. Since most somyangahàra melodic lines are performed by single performers, and most represent a dialogue between male and female characters, an aerophone is chosen that opposes the pitch of the performer – most commonly, a woman sings, and plays a low-pitched aerophone. These aerophones are typically flutes, considered to have the most human and most clear voices; reed instruments are sometimes used for particularly comic effect, and labrophones are also found. These ‘trumpets’ lack valves or slides, and instead rely on fingerholes, which produce a weaker and breathier sound – but then, loud volume is not required for the somyangahàra, an intimate form of art. Accompaniment, meanwhile, is provided most often by string instruments. Originally, this was likely to take the form of the kabolòka, an eight-stringed board-zither, but now the native raò, a tube zither with five or ten strings, is more popular. This is usually played by an accompanist, though it may instead by played the by the singer with the instrumental lines given to the second performer instead. Accompaniment is based on the theory of tone clusters: each cluster consists of four near-adjacent pitches, in primitive form played simultaneously. The cluster provides a grounding for the melody, which must pick only from the notes of the cluster (or the same notes octave aparts), as well as a harmonic progression, as one cluster resolves into the next. The accompanist may express these clusters though repeated simultaneous playing of all the notes, or by sequential playing, with the caveat that sequential expression of the cluster must be either overlapped enough or rapid enough that the cluster is perceptible as a whole, and the individual notes only as its parts. Typically this rapid arpeggiation of the cluster is the preferred style, although simultanous strumming may be used to give the impression either of simplicity or of power. Most somyangahàra have already been created. The core of the repertoire are the works of the Seven Sublime Poets, who lived under the Latter Banōm; other popular works are by either the Eighteen Lesser Former Poets (their less succesful contemporaries) or the Fourteen Latter Poets (eight of whom date from the Interaccord, six (and counting) from the Fourth Accord era). Devotees may also be aware of some works by minor poets. The creation of somyangahàra has not stopped – a great many nobles will try their hand at the old forms now and then, and a few will even become famous for it, but by and large it is generally believed that the older works are always better, and that later works are derivative and lack spontaneity. All nobles will know several dozen somyangahàra by heart, and those of an artistic inclination may know a hundred or more. Somyangahàra have become key educational tools, used in teaching reading, writing, music, deduction, and critical analysis, and quotations from somyangahàra are ubiquitous. There is thus a large degree to which the more famous somyangahàra are transmitted orally, either by adults to children in an educational setting, or through the medium of performances by family and friends. However, most somyangahàra (both the classics and modern efforts) are learnt from books. Typically a new poet of somyangahàra who wishes to achieve fame will first achieve local recognition through performances, and then seek to have her poems transmitted in book form. Moving Pictures, and Reaper Man could both be argued to fall inside Pratchett’s ‘golden era’, albeit at the less glistening end of it. Both could be argued to be among his best novels ever. Both could be argued to be utter rubbish. Witches Abroad is… well… let’s just say there are some clear trends in this era of Pratchett. Moving Pictures and Reaper Man are both novels about stories, the power of stories, about belief and imagery, and about the hyperreal, the postmodern condition in which reflections of reflections take flight from their foundations in reality and people’s lives come to be lived in a circular attempt to live the sort of lives that representations of life present themselves as representing. In other words, they’re novels about stories that tell their tellers. So is Witches Abroad. Witches Abroad doesn’t mess about with cunning symbolism, though. It leaps straight into the heart of the matter: mirrors and fairy tales. And, like its predecessors, it contains brilliance, and yet is terribly flawed. As with Reaper Man, the chief problems here stem from trying to make a short story into a short novel. Backing away from the emotional and narrative mess of that novel, this time Pratchett takes a more direct approach, merely diverting his protagonists through some filler. In fact, after a brief bit of set-up, the rest of the whole first half or more of the novel is filler, with little to do with the plot at all. The eponymous witches go, as the title suggests, abroad, where they encounter a series of amusing circumstances and get up to some humorous hijinks. Some of these are loosely tied into the idea of ‘stories’, with a lot of fairy tale references, but primarily it’s all an excuse for some fairly tired and traditional jokes about English tourists on the continent. Don’t get me wrong, it’s funny. Sort of. Now and then. And conceptually I can see why someone might think it was a good idea to show us the protagonists with the pressure off a little, letting us see a little more of their characters, and how they deal with different circumstances. The riverboat gambling scene was particularly enjoyable, and was even more so when I was a child. There is, really, probably no scene here that I would specifically want deleted. They’re all… well, none of them is Pratchett’s best work, but they’re all perfectly enjoyable and serviceable. The problem is that there are twice as many of them as there should be. A light diversion from the plot swells to take up half the book, and despite the repeated ‘ooh, something bad’s happening here’ moments, the effect is to drain away interest in that actual plot, which had started so promisingly. What’s worse, the scenes feel repetitive, as though Pratchett had sketched half a dozen ideas for a scene, and then rather than picking one he put them all in, like a theme and variations. By the end, I was really begging him to get a move on, which is really rare for me with early Pratchett. Fortunately, eventually, he does. When we hit Genua, boy does he get a move on. Perhaps the particularly vexing thing is that there’s actually enough content in the second half of the book to work by itself, with a little more padding. Instead, what we get is rushed. Scenes link together almost as though Pratchett can’t be bothered to fill in the gaps (because they’re so obvious, surely the readers will understand – well yes we do, but I’d like to be shown, rather than having to deduce). There’s never a moment to reflect or get our breath. Foreshadowing and the build up of tension and the imparting of decades of backstory and red herrings and plot twists all have to be squeezed into a couple of pages, with no time to breathe or grow in the imagination. What that does is produce a story that is gripping and page-turning. But what it also does is produce something that’s…. well…. cartoonish. I adored this book when I was young; re-reading it, I felt like the times when I’ve tried re-watching the cartoons I loved back then. A cartoon can rely on the imagination of the child to fill in all the gaps, to take every intimation of importance and significance and run with it, and amplify it. Children are good at turning sequences of events into stories. As an adult, however, I find I need a little more help. Too often here I felt I could feel the joints where the thing was bolted together shoddily. It didn’t help that the book has more than the usual Pratchett quota of ideas that go nowhere, scenes pushed in for the sake of a cheap laugh, jokes that may not entirely be in character; and then of course there’s the way that things just happen because they happen, with a deus ex machina that isn’t just not avoided, but is positively licensed by the book’s “stories want to tell themselves” theme. The ending also, again like that of Moving Pictures, and Guards! Guards! before it, is just a touch too complicated and prolonged. But then there’s the other hand. And that’s the hand where the story does work – that’s the side of the brain that does suspend disbelief and just go with the flow of the narrative. And that side of the brain had a whale of a time. Because the climax of this novel is about as… well, climactic… as Pratchett ever gets. Brilliant image comes after brilliant image, badass quip after badass quip, portentuous philosophical rebuttal after philosophical portentuous rebuttal. This is the book that makes the witches as characters, I think. Equal Rites was only a tangential introduction to Granny; Wyrd Sisters a tentative outing. Witches Abroad is where Magrat becomes a rounded character rather than a punchline, Nanny’s already considerable hidden depths siddle their way up to the surface, and Esme Weatherwax becomes…. legendary. It helps that Pratchett doesn’t hold back on the shear amorality of it all. There is, he makes clear, a good and a bad side to things, and Our Heroines are the ones who know which is which… sort of… most of the time… but that doesn’t mean they’re nice people. Oh no. As Magrat notices a couple of times, when you get right down to it Granny and Nanny are both horrible people. And Magrat’s not much better than them, and to the extent that she is it’s mostly just because she’s a wet hen too timid to be horrible. Yet they’re the good guys. The bad guys are far worse. And then there’s Mrs Gogol. Mrs Gogol is one of Pratchett’s greatest creations precisely because it’s not just unclear which side she’s on, it’s not clear what it means to be on her side. Too many stories fall into over-simple dichotomies of good and evil… Witches Abroad is a rare novel that shows us three sides to one story. It’s not always succesful in how it does it, but it’s impressive that it does it at all. It’s also an early intimation that although Pratchett is very talented at writing about England (whether that’s Ankh-Morpork’s London or the rural countryside of Lancre and the Octarine Grass Country), his works often seem most potent and alive when he allows himself a new and more exotic location. Despite the many great books Pratchett wrote later about Ankh-Morpork, I can’t help but wish we’d seen some more novels set in Genua, a setting that he manages to make vibrant and real – feasting on the echoes of both fairy tales and of Louisiana without feeling like a cheap parody or imitation – with admirably little effort. Before I’ll forget, I’ll also add that Witches Abroad is particularly stylish in its use of foreshadowing and callbacks – something Pratchett always dabbled with, but used more prominently here (and even more prominently in some of the books to come). This includes some fairly covert symmetries in addition to the obvious: for instance, only the observant may notice that the initial and final portions of the book feature prominent allusions to orchestral pieces by Mussorgsky, which pieces may be taken generally as symbolic of the distinction between home and abroad for the protagonists of the novel. So what do we end up with with Witches Abroad? Well, a novel that can be seen in either of two ways. On the one hand, it’s an entertaining adventure with a really thrilling climax. It’s wonderfully alive, it develops memorable characters and settings effectively, and it’s very well-written. It really shows us what Pratchett can do, on every level – stylistic, narrative, and thematic. And all this is why it used to be one of my favourite Discworld novels. Until I re-read it. Now it’s not. Because the other way to see it is as a fundamentally light and hollow novel, the shakily-constructed but admittedly impressive dramatic conclusion of which fails to fully obscure the extent to which most of the book is filler. And so I’m torn. I felt the same way about Reaper Man; the difference is, the brilliance of Reaper Man was enough to outweigh my concerns, and Witches Abroad didn’t quite manage to blow me away to the same degree this time (though it did when I was younger). And I don’t want to suggest that the negative here should wipe away the positive – the good in this book is not an illusion. It’s just… I think that what we are seeing here is a brilliant author writing at the peak of his powers, and that that brilliance is enough to dazzle us a little here and there, but that fundamentally this is the wrong book, or the right book wrongly constructed, and although he tries impressively there’s ultimately not enough to grab hold of here for him to be able to bring his full powers to bear. Adrenaline: 3/5. The somewhat boring, unimportant filler sections of the book would have pulled this down, but the powerful (if not entirely earned) ending lifts it back up again. Beauty: 4/5. Pratchett’s prose is stylish and peppered with gems, and the end has some great imagery. But there’s also too much dead weight here. Craft: 4/5. See last answer. Like an uncut diamond, the quality is immediately apparent, but its sparkle is dampened by excess material artlessly aggregated to it. Endearingness: 4/5. Too light and uneven for me to entirely love, but still really, really likeable. Even the filler material, while dragging the book down as a whole, is still basically enjoyable. Originality: 4/5. The predictability of a story based on other stories is ameliorated, and more than ameliorated, by the wit and skill with which multiple source materials (French, German, African and Russian) are woven together and made distinctively Pratchettian. OVERALL: 5/7. Good. Perhaps not Pratchett at his absolute best, but very memorable, and sits perfectly happily within his ‘golden age’ novels without any need for embarrassment. As (almost) always with Pratchett, a really fun read. While probably doesn’t need to be included in many ‘best of’ lists, it’s still an important book for Pratchett fans, both for the continuing development of the three protagonists and for helping to explain his central concerns in this period. Other than the Rincewind books, this is the first Discworld book that’s a direct sequel to another, so it may be better to read Wyrd Sisters first; on the other hand, Wyrd Sisters is only really connected to this through the main characters and a few references, and the characters are vividly painted here anyway, so there should be little trouble reading this before the prior novel. Well, after those three little Rawàng Ata posts I made last month, I’ve rather gotten bogged down in this next one. In fact, I’ve decided I’ll split it up and post it in bits while I finish it up. Apologies for lack of glossing in the examples, but it should be fairly obvious. Once I’ve got some more of these articles down, I’ll edit and proofread and whatnot and make some nicer pdfs out of them. Anyway, today’s post is on how Rawàng Ata handles ‘politeness’, to which the answer is: extensively. By ‘politeness’, I should say, I’m meaning everything to do with encoding social hierarchies into the language. The Là are a stratified and hierarchical society, and Rawàng Ata reflects this reality linguistically in several ways. There are six broad ways in which these distinctions are manifested: directive syntax; reference through agreement prefixes and pronouns; animacy hierarchy effects; possessive vocabulary; speech styles; and pragmatic politeness rules. Directive syntax is the decision to use a particular kind of verb, or to treat verbs in a particular kind of way; verbs used in this manner agree with two arguments rather than just one (if transitive), and use a wider range of agreement prefixes. Directive syntax has no semantic content, beyond a vague implication of definiteness; it is almost entirely a matter of politeness. Within classes, directive syntax is only typically triggered by the use of an explicit first- or second-person pronoun, which in turn is largely avoided in order to avoid directive syntax. If directive syntax is used at all between people of the same class, and even more so if it is used with only third-person referents, it is usually with real or pretended seriousness, stiffness and formality. In urban areas, some thugs are known to use directive syntax between each other, and to demand it from their interlocutors; this, however, is viewed as tantamount to a crime by the true authorities. In talking to a particularly conservative or strict person, particularly somebody older or more powerful (or when the speaker fears being overheard), directive syntax may also be used when any referent is or is possessed by a person of higher class. Between social classes, however, directive syntax is always required from the lower-class speaker, no matter the topic under discussion. Primarily and most rigidly, this applies between nobles and non-nobles (in theory the true distinction is between freemen and tenants, and hence rural freeholders are considered ‘noble’ for linguistic purposes; however, while aristocrats usually consider rural freeholders to be noble, the lower classes do not (indeed, they usually look down upon them), and so will not use directive syntax to them unless in the presence of a true noble). Among non-nobles, a further distinction is less rigidly made between sublandlords (gentry) and tenants; among nobles, a further distinction was traditionally made between nobles and the royal family, but as there is no longer a royal family this has lapsed. The tenant/freeman dichotomy is furthermore emulated in personal relationships of great authoritative distance – directive syntax is used (among nobles) with people far above the speaker in the hierarchy of the family, and among the lower classes invariably toward their own personal landlord, no matter how small the gulf in class between them. It may also be emulated in more specific and personal relationships, as between a client and a patron, a student and a teacher, or between lovers; it is a formal register, but more importantly it is a respectful and submissive one. However, it is not only the junior in any relationship who adopts directive syntax; the senior is also expected to employ it. Here, though, the pragmatic implications are more complex. In general, if a senior (a noble, patron, teacher, landlord, etc) uses only discursive (i.e. non-directive) syntax, they are doing one of three things: they may be offending the junior speaker by refusing to take their formality seriously or acknowledge their respect; they may be flattering the speaker by showing their comfort and informality with them; or they may be waiving the requirement of directive syntax and freeing the junior speaker to speak to them as an equal. In general, if it is the second of these options, the speaker is more likely to begin with directive syntax and then shift to discursive, as though forgetting the formality of the situation, whereas in the other two instances they are more likely to use discursive syntax all along. All junior/senior relationships can be waived in this way, apart from the fundamental distinction between noble and commoner, which cannot be waived (nor can directive syntax ever be abandoned when using explicit first- or second-person referents; this is wholly distinct from the normal class-based system of use). It should be noted that waiving this requirement does not by itself render the junior partner free of other obligations toward politeness; nor should it be assumed that the requirement will always be waived where there is good will. It is common, for instance, for teachers to always insist on directive syntax toward them from their students and former students when they are discussing matters on which the teacher is an expert, even if the requirement is waived when the conversation turns to other matters. A word should be inserted here about the ambiguous position of house-servants. Although these are commoners, they are often treated as nobles for the purposes of directive syntax both by their masters (except in situations of direct command) and by other commoners; this is even more true of house orphans. The use of directive syntax, then, is primarily a matter of pragmatic context: the most important factor is the relative status of the the speaker and listener(s), followed by the formality-status of the conversation. The ‘absolute’ status of the speaker or listener is only a tertiary concern, if that. The selection of pronouns and agreement affixes, on the other hand, is primarily a matter of absolute status. The use of any overt first- or second-person anaphora at all, however, is itself a matter of selecting directive syntax, with all the implications discussed above. If a speaker does choose to employ directive syntax, they must select both a pronoun and (where applicable) a verbal agreement affix to use. This is an area of the language that has somewhat degenerated in recent centuries, and current practice is both simpler and more flexible than that proscribed in former years (and which may still beseen in some poetic contexts). If directive syntax is to be used, there are five possible status levels to choose from in selecting a second-person pronoun. The lowest level, represented by the pronoun tuya, is used in two circumstances: with foreigners, ethnic minorities, or landless people; or between two people who know each other closely and are on friendly terms and share the same social class with, furthermore, no overt hierarchical relationships between them; in this second use, it is informal, and may be objected to, though it is very common between, for instance, family members or fraternity members. The second level, represented by yòtuya and àituya, is the appropriate level for addressing commoners; note that yòtuya is the default, and àituya a special feminine form that also denotes either a degree of affection (romantic or otherwise, particularly between women) or a degree of respect for an older woman from a man (it would be used by a man (of any class) of a common woman he was wooing, by a noble woman of a favoured maid, or by a common man of, say, his mother-in-law, or a midwife). Furthermore, àituya is primarily used toward tanù, and only rarely toward kanuhà, and almost never toward kùnyi or mahàuko. The third level terms ranatuya and kulatuya are used for free (i.e. noble, or rural freeholder – note that even those who decline to use directive syntax in conversation with a rural freeholder will still probably allow them the third level pronoun) men and women respectively – there is no default assumption toward the male as there is in the second level, and women are never referred to by the male pronoun. However, there is an oddity here: although mahàuko are treated as women and addressed with kulatuya, kùnyi are not treated as male, and likewise are addressed with kulatuya. The fourth level has only a single basic pronoun, hòngātu, and is used for particularly senior aristocrats (the stem houses of old septs, or the matriarchs and patriarchs of other houses, as well as government ministers, senior monks, and admirals); the fifth, with its pronoun ārātù, is used only for the stem houses of clans and possibly for the Prime Minister (however, see below on graduating verbs). Higher levels did once exist, but are now strongly derogated, and their use would appear grossly insulting. In general, it is permissable to refer to an individual by a pronoun one level away from what is appropriate – this is considered insulting in most cases (whether the level is degraded or inflated) (though see below), but is insulting in an acceptable way (it will provoke anger and disapproval if serious, but not outright retribution, and can be used sometimes in a jocular fashion). Using a level even further from what is proper may be seen as grossly offensive, but is more likely to appear idiotic, and this is only in practice done jocularly within very intimate relationships, and then only rarely. Complicating the above, several of these pronouns have higher ‘grades’: yòtuya and àituya become yàmatuya and then yàmātu and finally arayàmāntu; ranatuya becomes ōrānatuya and then ōndrānatotu; hòngātu becomes āndrahongātu. These higher grades remain within the same level, but are used in addressing somebody of particularly high status within that level. The number of addressees is also a factor, with higher-grade pronouns often used in addressing larger numbers of people. First-person pronouns, meanwhile, are rather simpler: there are only nine commonly used. The two fundamental first-person pronouns are luò and shiru; the former is the default option for commoners and rural freeholders, while the latter is the default for nobles, as well as for the wealthier gentry; however, these defaults are often over-ridden by conversational contexts, with luò a humble and submissive pronoun and shiru an assertive and demanding one (although neither necessarily implies a true power or authority imbalance – shiru may be used, for instance, to show that an individual is taking responsibility for a situation, even among peers), while luò may be used to concede defeat in an argument. Alongside these pronouns there are two pronouns that often supplant them. Bāya is a pronoun used by men (including kùnyi) with other men when there is no difference in class, power or authority between them – traditionally it is also used when men of higher rank address men of lower rank with whom they feel solidarity (a master to his manservant, for instance, or a ship captain to his sailors), provided they are not actualy issuing commands (when shiru would be used instead). Men may also use it when talking to their wives or sisters. Traditionally it is the only pronoun used by òro when talking among themselves. Women may also use bāya: either when talking to other women of the same class but lower status, or when assuming a male role as regards their sisters (kanuhà in particular will use it when talking to tanù), or one kanuhà talking to another, or a kanuhà talking to a male family member (though not when talking to a kùnyi), or when talking to a man of a lower class. The counterpart of bāya is kàya. This is only used by women (including mahàuko but not kùnyi), and it is used only by noble women talking to women of equal or lower class, or by common women talking to noble women. Bāya and kàya are primarily singular, but can also be used as exclusive plurals; however, the dedicated exclusive plural forms bāyatò and kayàto also exist to stress plurality. All four can only be used as plurals when all those included could legitimately use that pronoun themselves in those circumstances. Alternatively, shiru and luò can be used as exclusive plurals regardless of the details of the other participants, and shirutò is used to include a third party of particularly high station or respect (although a sufficiently high-status individual should merit a third person pronoun, not be relegated to the plural of the first person). All these exclusive plurals can also act as inclusive plurals when the listener is of markedly lower class, rank or station. Alternatively, nùruy is the inclusive plural for a listener of similar status, and wakūnda is the inclusive plural where the listener is of higher status. With third-person pronouns, the situation is even simpler: there are five. Adar is used for inanimate objects; dashi is used with animate non-humans; taìru is used with humans; and taindrùto is an honorific. Third-person pronouns are not number-sensitive. These third-person pronouns do not trigger directive syntax; nonetheless, they are generally used only in formal contexts, with pseudopronouns or anaphoric pronouns used otherwise. Finally, an important caveat to all the above must be mentioned, which is the concept of graduating and degraduating verbs. These are a small number of verbs that shift their objects to a higher class (second-person tuya > yòtuya/àituya > ranatuya/kulatuya > hòngātù > ārātù; third-person taìru > taìndrutò, first-person unaffected) while shifting their subjects to a lower class (the same in reverse, and all first-person pronouns shift to luò), or, more rarely, that shift their objects to a lower class (reverse of graduation, but third-person taìru is shifted down to dashi, and dashi down to adar, and taìndrutò is shifted to the special pronoun ātatairù). Noteably, somebody who would otherwise be addressed with ārātù cannot be the object of a graduating verb, as there is no higher class to graduate to, and instead an alternative construction must be found. I’ve always felt it was a bit unfair that much of what I post will be of interest to very few people. So, for a change, today I’m posting something that nobody will be interested in! … you sudden and mysterious influx of visitors today!